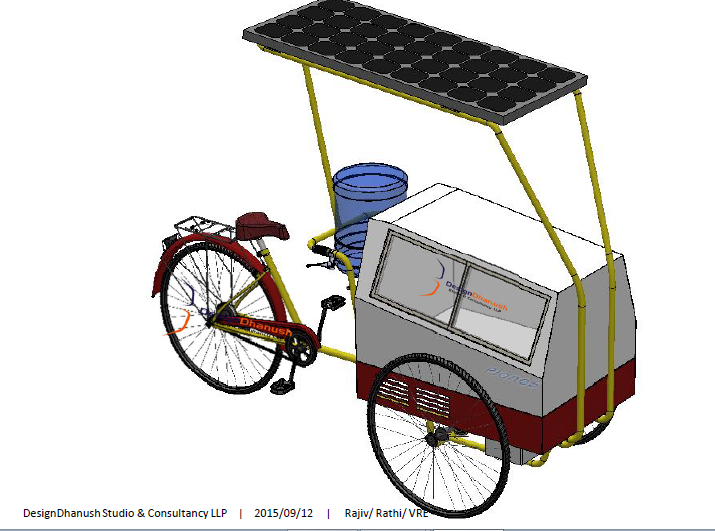 He has developed a solar powered ice cream kart, which allows the ice cream to be in its original form. I recently came across him and was excited to learn about his project. An electrical and civil contractor with railways, Mr. Rathi has also an experience in the maintainance and EPC contracts for wind and solar farms. Read more to know about the technology, challenges and his journey so far. 1) Sneha Shah: What are the challenges you are facing currently in promoting these karts? Mahesh: We have the technology of smart kart ready with us which we have tested almost for 1 year now, the only challenge presently we are facing is to get the required funds to set up business model for such karts. 2) Sneha Shah: How are these karts different from the traditional storage units? Mahesh: Traditional karts use dry ice or eutectic freezers, which need to be charged by electricity, but the real problem with these systems are they cannot hold the temperature for long time and have their own limitations as the outside temperature increases. Since our kart uses solar and battery system, so it continuously pumps the refrigerant, maintaining the temperature to keep ice cream frozen and fresh. 3) Sneha Shah: You mention to using a 250 W solar panel costing Rs 40/ watt, but the market says solar panels are sold at prices as cheap as 55cents/ watt. Why is there so much difference in the rates? Mahesh: I agree with you. Prices of solar panels are down up to 55 cents/ watt, but when we purchase them in bulk quantity in Kw size. Here our purchase quantity is small, as we have talked about only 5 karts, so have to pay as per Rs 40/ watt. 4) Sneha Shah: Your goal is to make 5 karts in the next 45 days. Where do you plan to distribute these karts? Mahesh: I have planned to start with these 5 karts in Thane district or Mumbai. 5) Sneha Shah: Do you think there is a relevant market for these karts in India? Mahesh: Yes, India is a good market for these types of karts, as you know we have long sunny days around the year, and this small solution will be very useful for people travelling for work in Metro, local trains and buses. 6) Sneha Shah: Will your venture be profitable for you? Mahesh Rathi: Yes, this venture will be very profitable, as it does not require any infra structure set up, and can be useful for common men to have ice cream and distilled water on the streets, suiting his pocket size. 7) Sneha Shah: Can you explain the working mechanism in brief? Mahesh: The working of this kart is very simple, it has a DC refrigerator system with a battery back up inside, which is charged by solar panels fitted on roof top of the kart. 8) Sneha Shah: How and when did you get the inspiration to manufacture this smart kart? Mahesh: Last year during mid of May I was travelling to New Delhi for my work. One late afternoon in the scorching heat I decided to have an ice cream from the road side vendor, the ice cream candy was much melted. I had an argument with the vendor but he said that he was helpless, as his traditional freezer becomes ineffective after 4 pm in this heat. This made me think that I should start working in the cooling sector by solar energy. I was already working in the field of renewable energy sector in wind, solar, biomass from the past few years and knew that there were many solar based heating products available in market, but very few offering cooling solutions by solar energy. 9) Sneha Shah: Are you working on some other solar product/ project as well right now? Mahesh: Yes, I am working on other products like fabricating commercial and residential Solar Ro water purification systems, wind turbine supported cold rooms for commercial fishing boats, solar evaporative coolers with advantage of inbuilt solar inverter. 10) Sneha Shah: What will you like to say our readers to encourage them to come forward and contribute to your cause? Mahesh: I can only request all the readers that I am trying to make cost effective renewable energy products which are useful in day to day life, so that we can approach more and more people in our country and make our environment clean, green and healthy. Solar powered products are rapidly gaining traction across the globe, mainly due to its clean and green nature and cost efficiency. To view other solar products in India, click here. To support Mr. Rathi’s cause, please visit here.